Roblé Ali is known in New York City simply as “Chef Roblé.” Originally born in Poughkeepsie, N.Y., Ali relocated to the city after culinary school, where he started his successful catering company. Over the years he has cooked for everyone, from President Obama to Michael Jackson. 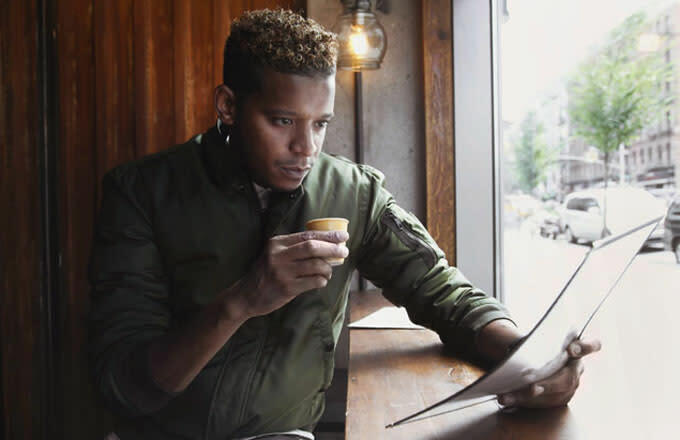 In order to make his food more accessible to his community, he opened his restaurant Streets Williamsburg in Brooklyn earlier this year. Ali, who currently lives in Brooklyn, as well, shared with us why he felt a duty to his borough and what he enjoys most about it. Roblé wears the COACH MA-1 jacket in surplus nylon. Why was it important for you to open Streets Williamsburg in Brooklyn? Well, I am a caterer, so I’ve operated a successful catering business for about four years now. A lot of people are fans of our food, but very few people can afford to hire a caterer. So, I wanted to be able to have a place where people who wanted to eat my food could actually come and have a meal. It is my first restaurant and it had to be in Brooklyn, there is no other place I would open my first restaurant. Brooklyn is my home and I felt a duty to the borough to open my first restaurant here. 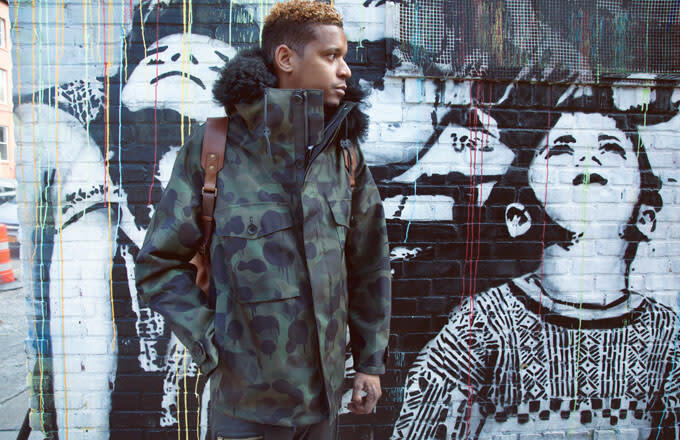 Roblé wears the COACH MILITARY wild beast utility jacket. What drew you to the murals near the restaurant? There is a lot of very cool street art around the neighborhood. I’ve been doing a little walking around there. I was lucky enough to find a great place right on Broadway [for Streets], pretty close to the water. There is a lot of new construction and restaurants opening up on that block. It is a great location. What do you do when you aren’t at the restaurant? I just take a walk or run around Fort Greene or Clinton Hill, if the weather is permitting I ride my bike everywhere. I love riding my bike. It is a beautiful looking place, you know? There are lots of trees and brownstones. I spend time with friends and my cousins. I just moved pretty much right next to them. I also frequent a lot of restaurants and bars. Is there anywhere specific you like to go? I like SoCo and Marietta in Clinton Hill, it is a really good spot. I like to catch a show at the Brooklyn Academy of Music. I like it for a movie, because I am not sure how old it is, but that place has had to be there for 100 years. It is like you are taking a step back in time. 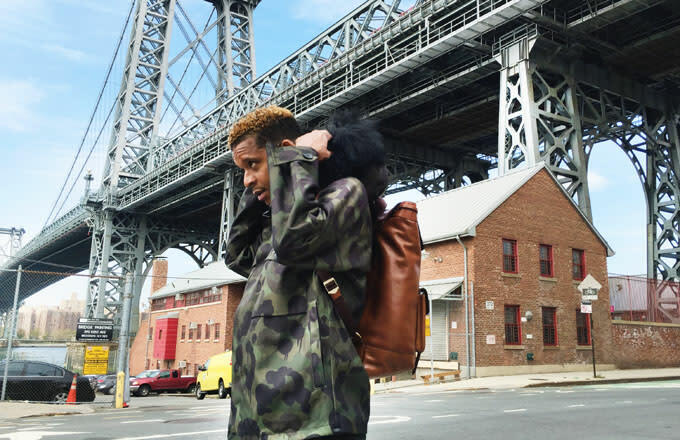 Roblé wears the COACH MILITARY wild beast utility jacket and the COACH BLEECKER backpack in fawn leather. What do you enjoy most about the Brooklyn? Brooklyn is like its own city. There is a great diversity of culture here. People, especially in my neighborhood, you see all types of people from different walks of life on the same street. I can’t think of anywhere else in the city where you have this kind of diversity. And it is beautiful—the architecture is great. Brooklyn Museum is really nice too. They have a lot of great exhibits. I am actually doing the “Everyday People” dance party there next month. Roblé wears the COACH WILD beast c101 sneaker in military camo/black. What do you like about dressing for fall? Fall is the best in New York. It is the best season for fashion in my opinion— it is when I pay a lot more attention to what I wear. I like lots of layering, and my boots, and leather and suede jackets. I like to play around with hats. They keep me warm. If it is chilly out and I don’t have a hat on my head, I will freeze. I have to have a nice bomber, for sure. I like a nice hooded coat and jeans for the most part. 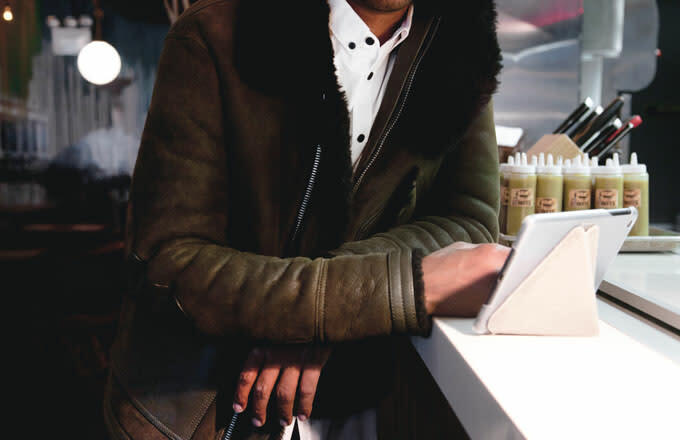 Roblé wears the COACH Shearling b3 bomber jacket in military.